Last week, Nathan was afraid of the water. He wouldn't step onto the pool steps without arm floats and he wouldn't put his face in the water without bribery - let alone his entire head. The story's a bit different now. 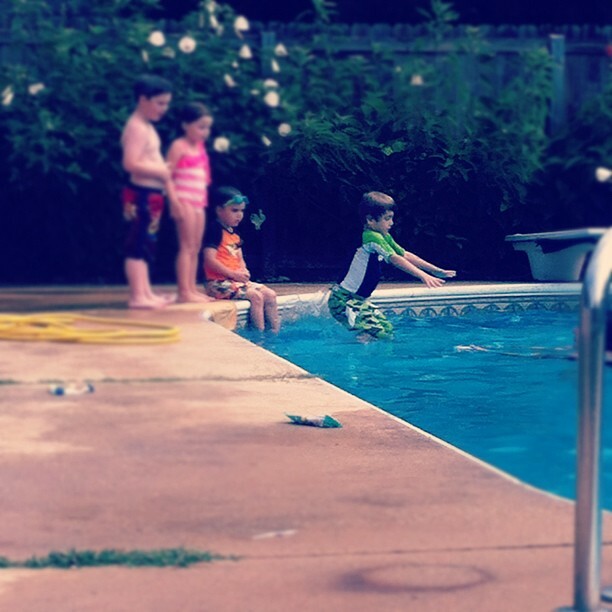 After five swimming lessons from a great couple in Mineral Springs, my little fish has found his calling. Just one day after his final lesson, he was begging me to go beneath the surface to listen to his underwater song. The second he popped up, he grinned, took a breath, and dove back down. I watched as his big brown eyes scanned the new world. He jumps into the shallow water after shooing all help out of the way. The kid asks to jump into the deep end, swim to a parent in the middle, and proceed to the ladder, legs flailing wildly. He spits and gasps and rubs his eyes and proclaims, "I'm going to do it AGAIN!" Before we know it there's a giant splash and we're off. My overly cautious son gained courage with each lesson. And he did it by himself. He mustered up his own courage, put on a brave face, and simply jumped in. I haven't been this proud in a long time. I think the only person prouder than I am is Nathan himself. He met a fear, literally face-first, and he won. PS: Please excuse my use of Instagram. My camera is under the weather. However, after a trip to the shop (and the addition of a birthday lens *fingers crossed*), my photography will be back and better than ever. I have a feeling the pool trips will be frequent this summer, so check back soon for photos.